Do you ever fall into the mindset that memories are made from big (and often expensive) events? 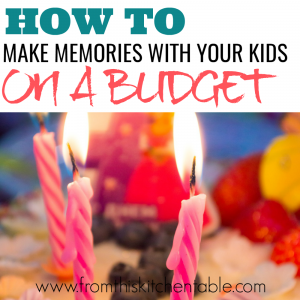 If you are a mom living on a tight budget, that can cause a lot of stress and overwhelm. We want our kids to grow up having fun memories of their childhood and we worry about our limited funds. 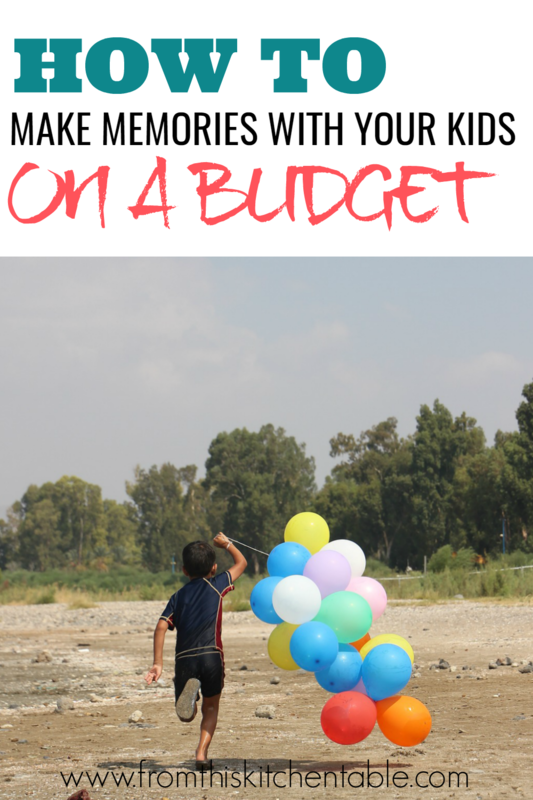 Is it even possible to make memories with your kids on a budget? Affiliate links may be used in posts at From this Kitchen Table. Thank you for supporting our work at no cost to you. Take a minute to think back to your childhood and the things you remember. Sure, there might be a big thing or two that comes to mind, but I bet that there are many little traditions and memories that stand out. I remember a snowman named Annette, playing in “mini Lake Superior”, breakfast in bed, and a Fisher Price cassette player with a speaker and microphone that my family had to put up with in the car on a 14 hour drive. Especially when your children are young, they don’t need fancy and elaborate. Most of the time they enjoy little (and often free) things just as much. We put expectations on ourselves that our children don’t have. So instead of expensive, fancy, and elaborate I challenge us to find the small things and make the most of them. A large party isn’t a have to. 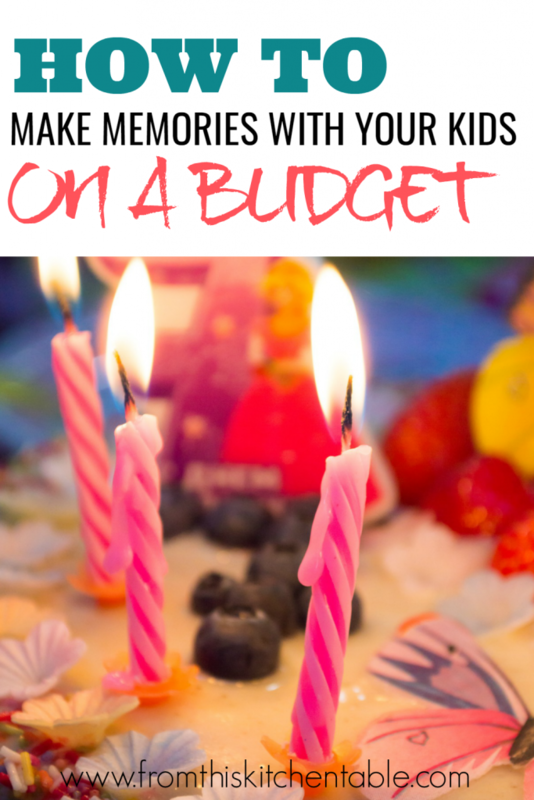 Start traditions they’ll look forward to each year that will be easy on your pocket book. Birthday balloon, streamers, breakfast in bed, picnic, special dessert, free family outing. Those are just some ideas to help you start brainstorming. Don’t feel guilty about not being able to take your kids to Europe or Disney World. Instead, make memories closer to home. Take day trips to near by cities or state parks. Most likely there are plenty of things in a couple hour radius that your family has never had time to explore. Stock up on snacks and favorite treats when they are sale to enjoy on these trips. Take a few afternoons to explore your own town and the community events, museums, and parks it offers. Don’t just play a game. 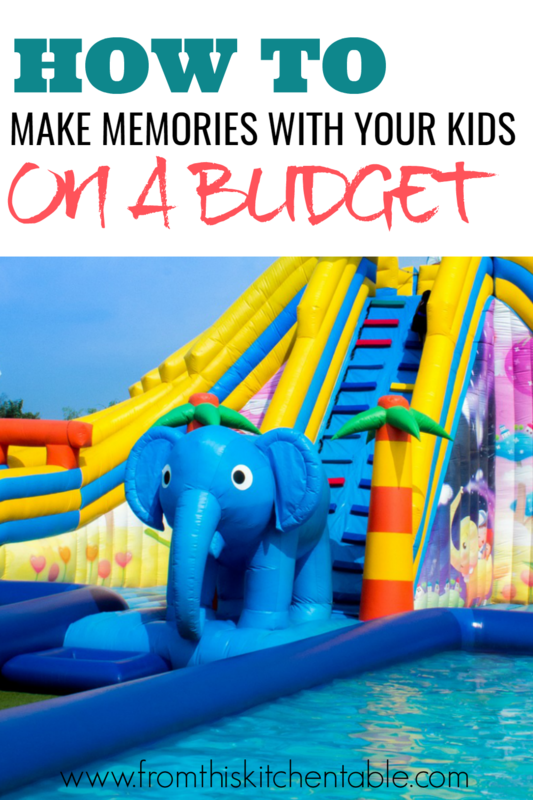 Turn it into a “family fun night”! Have homemade pizza and ice cream or another kid pleasing meal. Pull out a few games, put away all the phones, maybe even grab a couple of cheap prizes from the dollar store and your kids will have a blast playing all the table games in your house. Movie theaters are fun but they also can be pricey to bring the entire family to. Rather, have a movie night at home. Like with the game night, turn it into something fun! Make movie tickets for everyone, have a double feature, pop a big batch of popcorn, make sure everyone has full water bottles, and find snacks and candy on sale so everyone can have their favorite. Sit on couches or bring out blankets and pillows and take over the living room floor. Going grocery shopping? Grab a kid or two and bring them along. Make a detour to the park or let them pick a little something extra out at the store. Have them help you pull items from the shelf and put it in the cart. Is there a doctors appointment? Bring a book to read aloud in the waiting room with your child. Or bring a coloring book and see how excited they’ll be that you want to color with them. There are a few people out there who actually enjoy chores. I’m not one of those! Thankfully, my kids are young enough that cleaning still excites them. In fact, my older two fight about who gets to vacuum. Instead of cleaning solo, slow down and offer to let a child be your helper and work together. It might take longer (and not be as thorough) but you are training your child and connecting with them. Play restaurant. I remember doing this as a kid and my children have started doing it. Take supper up a notch by setting a fancy table and lighting some candles. Have the kids make place cards and menus. Take turns being the server. You could use fun conversation starters and everyone can practice using their best manners. 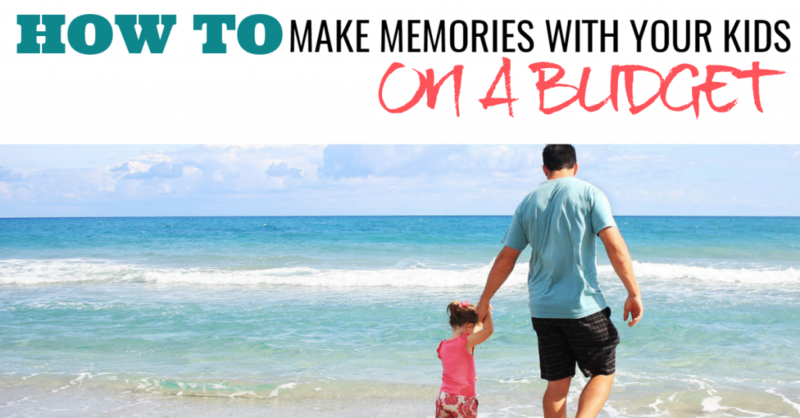 What are your favorite ways to make memories with your children? This entry was posted in Uncategorized on June 21, 2017 by Deanna Michaels. My kids are grown-and the truth of the impact of small family traditions is something I now get to hear from them as they recall special memories. A couple of things they still talk about: Pizza (homemade) and a movie (checked out from library) night every friday. On our way to campgrounds stopping at Forest Ranger stations and getting to pick out free posters of animal tracks, nests, etc. (no idea if they still do that). Once each school year a surprise “Mom and Me” day-just the two of us doing something they especially enjoyed. When they were older, we had a less frugal budget – but it is the simple, regular traditions with their parents they remember most fondly. I LOVE this!!! Thanks so much for sharing. It encouraged me and motivated me to keep pressing on a making the effort to create simple traditions, even when I don’t want to. Some days are longer than others and I really want sleep – but I know I won’t regret taking the time to invest in the kids.